After an exciting week of Atlantic 10 basketball, the conference continues to experience some ups and downs. Below are the best performances from the past week. The performances must have come in a win, and no two players from the same team can be selected. The level of competition was also taken into account. St. Louis nabbed the biggest nonconference win for the A-10 in the early going by taking down a talented Virginia Tech team, and Javon Bess was a major reason why. St. Louis beat Virginia Tech behind its toughness and athleticism, and Bess was the catalyst. It was a true team effort as D.J. Foreman, Jordan Goodwin, Hassan French and Davell Roby all came up big in moments, with Aaron Hines hitting a couple ridiculous shots, but Bess was the steadying force on both ends of the floor. 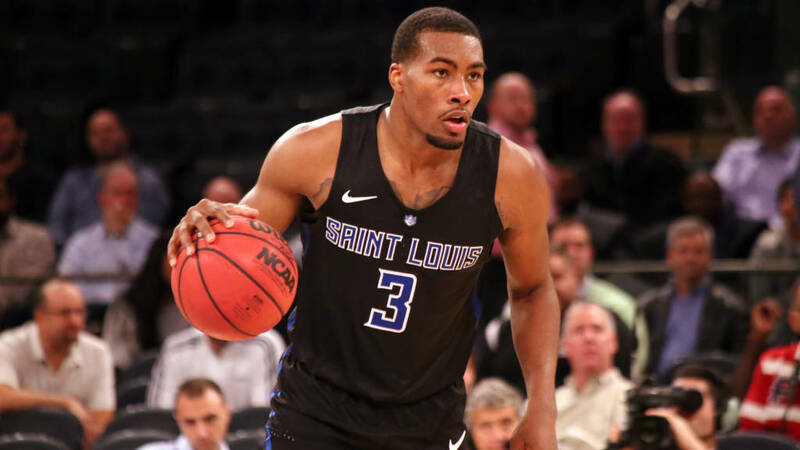 The Michigan State transfer looks like an all-conference player early on, and even with the tough loss to Providence on Friday, St. Louis has proved its newcomers are ready to compete for a top spot in the A-10. Peyton Aldridge is the epitome of consistency, and that consistency was on display Tuesday night against UNC – Wilmington. Even though UNCW is not as talented as they have been in past years, they are still coming off of consecutive NCAA tournament appearances and they had absolutely no answer for Aldridge and the Davidson offense. Early on Aldridge got everything he wanted in the post, and after UNCW began to double him, he found the open shooters on the perimeter. While he did much of his work in the post, he also knocked down four threes on his way to a 37 point effort. If Aldridge continues to make good decisions out of the post and his teammates can knock down open looks, Davidson’s offense will be impossible to stop this season. B.J. Johnson might have had the best week of any player in the A-10 with multiple impressive performances, but it was his 20 points and 14 rebounds against Penn that stands out. Penn will finish the season near the top of a talented Ivy League and sports one of the best players in the conference in power forward A.J. Brodeur, yet he was no match for Johnson’s versatility and athleticism. Johnson continues to prove that A-10 prognosticators may have made a huge mistake leaving him off of the preseason all conference first team, and La Salle will continue to rely on him if they want to finish in the top half of the conference. One of many impressive A-10 freshmen in the early going, Taylor Funk came to play against UIC on Monday and followed it up with a great Saturday night showing against Princeton. St. Joe’s has taken a few hits early in the season, none bigger than losing Lamarr Kimble for the season, yet the emergence of Funk could help save their season. Funk went 5-6 from three and 7-8 from the field coming off the bench to propel St. Joe’s to its second victory of the season. While Charlie Brown is an electric shooter, Funk should emerge as an additional outside threat with size to help St. Joe’s spread the floor and run a more fluid offense. In what has been a struggle for Dayton early in the Anthony Grant era, Josh Cunningham has been a force keeping the Flyers afloat. After losing to Hofstra in brutal fashion on Thursday, Friday’s matchup against Ohio felt like a must-win game. Cunningham dominated with his physicality, grabbing 19 rebounds and attacking his way to 18 points. Cunningham is one of the most physically gifted and talented players in the conference, and he will need to keep this pace up if Dayton hopes to compete with the best teams in the A-10. Dayton’s Darrell Davis broke the record for points scored in the Charleston Classic.